Planning ahead is key. I know this. I know I function so well when I do this. I know I will spend gobs of dollar bills to make this happen (aka – buy healthy meals prepared by someone else), but lately I’ve been focused on not letting my crazy life take precedence over the fundamental things that make my life spin successfully. 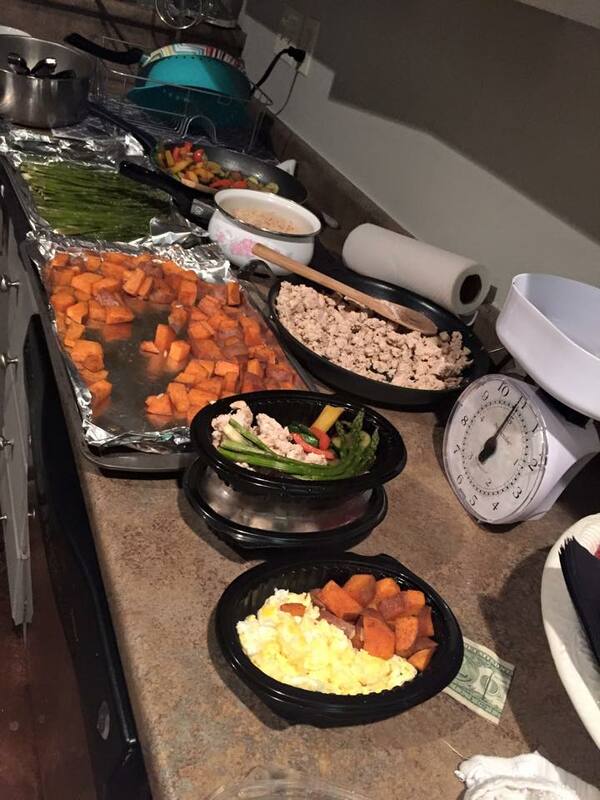 If meal prep/planning scares you, no worries it scares me too. I never – under any circumstance – except pizza – eat leftovers from a restaurant. It’s a flaw, I know. I just can’t. It’s hard for me to eat off the same meal more than three times – I – DON’T – WANT – TOO. 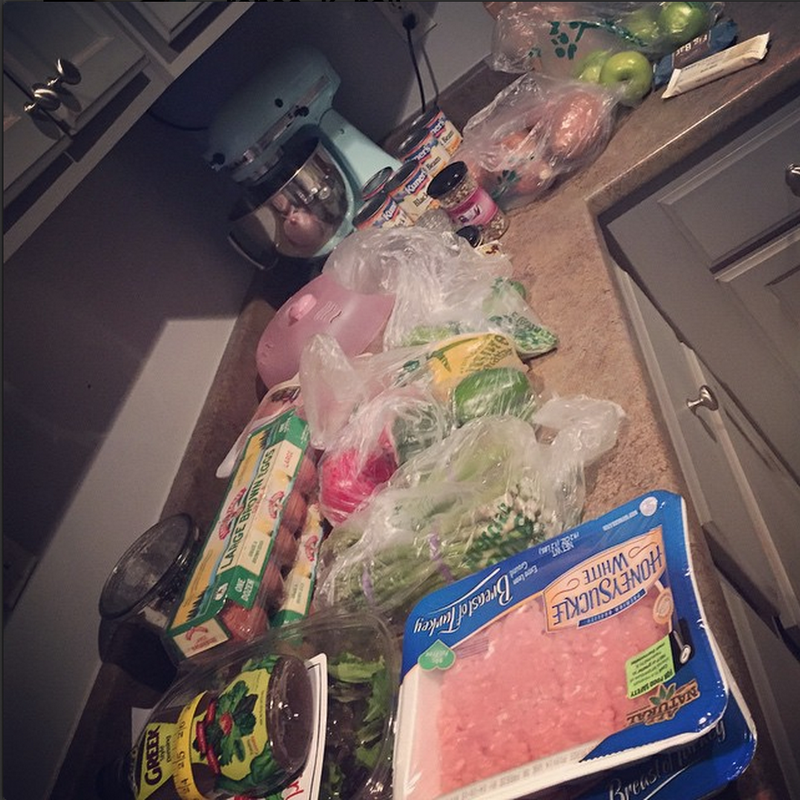 Prepping meals has seemed daunting because it’s eating your life via a leftover. Luckily, this round of the weightloss competition I’m really focusing on how I think and trying to think through the flaws. My life isn’t going to get simpler, I know that. I’m too fun. It’s always going to be wild. I’m always going to be throwing lots of parties for me and others and I’m always going to be starting and running businesses. It’s how I’m wired and I love it. SO this is the perfect time to learn to ride the crazy train without losing sight of my personal goals. My week of groceries! I tried to pay someone to grocery shop for me but all my friends were busy, so I had to do it myself. Whomp, whomp. Don’t act like you didn’t know I had a plan. It was a well crafted timing game I created in my head to get the cooking done in the least amount of time. Other than the crockpot chicken, it took me a little under an hour to cook the rest. Asparagus – I used 1 ½ stalks I laid them out on tin foil on two baking sheets, sprayed them with olive oil with my oil mister (fun kitchen gadget, btw) and sprinkled black pepper on them. Bake at 425 for 18 minutes. 3) I cooked the ground meat and have my own homemade low sodium Mexican seasoning. I did about two pinches so basically amongst two pounds of ground turkey you cannot taste it at all, haha. But mentally I feel better. Once I cooked it I set it aside. Sweet Potatoes – I cut up three and put in a bowl. I used to 1 tablspoon of coconut oil, 1 tsp of ground cumin, 1 tsp of paprika and I was going to use 1 tsp of chili powder but I apparently don’t own that. I sprinkled with black pepper and mixed it all up in the bowl. Then laid it out on tin foil on a baking sheet. Bake at 400 for 20 minutes. 5) Around this time, I got real hungry and I ate some peanut butter and drank some kombucha. 6) I took the asparagus out and lowered the oven temp to 400 and put the sweet potatoes in for 20 minutes. I sliced zucchini and two bell peppers. I put them in a pan and sprayed with my oil mister. I like this because I can more evenly cover the veggies and use less oil because I feel like I’m controlling the distribution better. Then I sprinkled with pepper. I sautéed them and set aside. 9) Pulled out my crockpot & I put one pound of chicken in the crockpot with half of the container of locally made Salsa. If you’re doing two pounds use the whole container. I find the locally made is the freshest and has the least amount of Sodium and better nutritional breakdown. I buy mine from Rouses it’s by the organic veggies section. 11) Eggs – I scramble two whole and one egg white for breakfast every morning. I do this every night for the next morning so I did the one for the next morning at this time. I do (4oz of lean protein, 1 cup of veggies, ½ cup of complex carb) in each container. So it looks something like the following. I pack up two fulls days at a time and not the entire week. I’m sure you could do all five days, I just don’t like the idea of it being in a little container that long. I just do a variance of all the cooked items. Since they are not very seasoned when prepared I can add some when I reheat which allows them to taste a bit different, so I don’t get bored with the same tasting chicken. Chicken, rice, Sautéed veggies (I’ll mix together like a fried rice….) If I’m home I’ll throw back in a small frying pan to reheat and add an egg to it. I’ll pull out my snacks at this time for the next two days. I’ll bring my two days of meals/snacks to work and leave them there. I eat bfast 8:30 (Post workout), snack (16 almonds, normally) at 11, lunch at 12:45/1, snack (apple) at 3:30 and dinner at 5:00/5:30, then I’ll eat a later snack (Fruit, Peanut butter, eggs, etc). And now you know all about my food life.